As you’ll learn, my team and I focus on six management disciplines: Leadership, strategy, people development, structures, organization performance and culture. These are the same principles we’ve used with great success throughout our many years of professional experience as managers and leaders, and we’re delighted to share them with you. In the information that follows you’ll find a summary of the book, our bios, suggested topics for conversation, and example interview questions. We hope this information serves you and your audience. If you have any questions, need additional information, or are ready to schedule an interview, please contact us. From the small business owner to Fortune 200 CEOs, the highly skilled and accomplished manager understands and practices what Ed Eppley calls professional management. And like any other professional — athlete, musician, physician — mastering the skills required to be a complete professional manager takes continuous practice, fine tuning, and commitment. A professional management expert, Eppley has trained companies around the world. 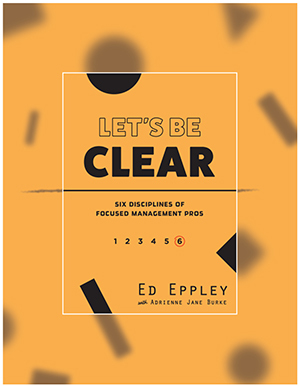 In “Let’s Be Clear: 6 Disciplines of Focused Management Pros,” Eppley brings that knowledge and expertise to a broader audience with an in-depth look at the full scope of professional management. He breaks down the six disciplines critical for today’s professional manager, explains the role of each practice, how to implement it and why it’s critical to master it. Every professional manager has room to become better. By committing to the six professional management disciplines, today’s leaders can develop a competitive edge for the future while building a sustainable and thriving business. “Let’s Be Clear” is available at: TheEppleyGroup.com, amazon.com, all major online bookstores. ED EPPLEY is a leading global expert in professional management, sales strategy, and performance management. He is a principal consultant for the Table Group, a Patrick Lencioni Company, and operates The Eppley Group. He has worked with executive teams at multinational companies across the U.S., Europe, China, Japan, and Australia. His clients include a “Who’s Who” of business category leaders such as BMW, DSW, Sara Lee, Bloomberg, Battelle, Goodyear Tire and Rubber Company, Speedway, Steamboat Ski & Resort Company, Value City Furniture, PSA Airlines, Emerson Electric, NECCO, Safelite Auto Glass, and others. A life-long entrepreneur, Ed started an advertising agency and a manufacturer’s rep firm selling to the industrial and construction markets before creating Tyson Eppley Management, ProspeX, and The Eppley Group. As a facilitator of the Course for Presidents at Aileron in Tipp City, Ohio, Ed helps owners of private businesses apply a system of professional management to identify and correct workplace problems. A professional career that has spanned more than 40 years, Ed has honed a skill for identifying talent, understanding executive challenges and spotting and improving problematic management. ADRIENNE JANE BURKE is a business and technology journalist with 25 years’ experience. She has been a contributing writer for Yahoo, Techonomy, Forbes, Technology Review, Huffington Post, and a wide range of corporate and nonprofit clients. Before becoming a freelance writer, she was executive editor at the New York Academy of Sciences, editorial director at GenomeWeb, editor in chief of Genome Technology Magazine, and managing editor of Industrial Safety & Hygiene News. There’s no doubt that good leadership is a key component for success in the world’s fast-paced, global economy. Yet 51 percent of organizations said their leadership is not at all ready, or only somewhat ready, to lead their organizations today. And 71 percent said their leaders are not ready to lead their organizations into the future. In an age of instant communication, emerging markets and endless opportunities to innovate, today’s leaders need to seize every opportunity to grow their competitive edge. And the truth is that most of them are quick to acknowledge that reality. They know they must invest in themselves and their employees to become better leaders. However, most of them also believe they can put these investments off for another day—that there are more important, more pressing matters to tend to. The reality is that the situations you face today are a direct result of the actions taken in the past. Decisions pushed aside, expectations that weren’t set, cultural changes that weren’t implemented, and marginal performers that weren’t dealt with back then are costing key employees, sales, and customers today. And months from now, your business will suffer the same consequences for all those important tasks you’re putting off or doing incompletely today. Now is the time to commit, to do what it takes to become a better leader. Every day you put it off is another day spent without achieving optimal results that benefit you, your company, your employees, and your customers. One thing is certain. The marketplace will continue to expand. Competition will continue to grow. And the best of the best will continue to rise to the top. In our experience, the simplest, more effective way to get there is by following the six disciplines for professional management: Leadership, strategy, people development, developing structures, organizational performance and culture. Below are a variety of conversation starters based on the disciplines of professional management. What follows each discipline is a sample discussion as Ed and his team would have it with prospective executives and leaders. As with all areas of life, the quality of our relationships has a substantial effect on our outcomes. Yet chronic levels of low trust in leadership and organizations are prevalent, with only 40 percent of employees saying they have a high level of trust in their management and organization. That’s a dismal statistic, considering everything from the clothes you wear, the language you use, and the cars you drive impact your effectiveness as a leader. So how do we increase those levels of trust? By being aware of the style we exude as a leader. Do your employees know your vision as a leader and as a company? Do they understand and believe in your reason for being and your strategies to get there? Before you answer, consider that a 2013 Gallup report that found only 41 percent of employees felt that they know what their company stands for and what makes its brand different from its competitors’ brands. You can’t get to where you need to be if you don’t know where you’re going, or fail to implement a strategy to get there. Without a set strategy, you jeopardize your company’s future. Begin by identifying your ideal customer. Why is it that managers often resist—or sometimes refuse—to delegate? Many leaders believe they save time and energy by doing things themselves. Unfortunately, that attitude contributes to the fact that a 2013 report found 70 percent of American workers are “not engaged” or “actively disengaged” and are emotionally disconnected from their workplaces. On the flip side, there’s some good news, though. When organizations successfully engage their customers and their employees, they experience a 240 percent boost in performance-related business outcomes compared with an organization with neither engaged employees nor engaged customers. Give your employees the opportunity to improve their skills and productivity. Coach them, delegate to them. Engage them. It’s difficult to overstate the importance of the structures we put in place. In fact, they affect our success more than the people we hire. When a business creates its ideal structure, it’s important that it be done as objectively as possible, without considering the politics or personalities involved. Equally as important is the need to realize that the perfect structure is aspirational, and as good as a structure is, we’ll always be in pursuit of a better one. When it comes to performance reviews, a staggeringly low 21 percent of people believe their organizations’ performance review process is very good. One of the top reasons is that employees don’t receive valuable feedback as to whether they’re performing their jobs well or how they can improve at their job. We’ve found it’s not a matter of managing performance. Rather, it’s a matter of setting clear and quantifiable expectations to hold people accountable. In recent years, company culture has emerged as a key indicator to a company’s success. Just how important is workplace culture? One recent study found that more than 50 percent of senior executives said corporate culture influences productivity, creativity, profitability, firm value, and growth rates. Ninety-two percent believe improving their firm’s corporate culture would improve the value of their company. That said, only 16 percent of them said their firm’s corporate culture was where it needed to be. There’s no doubt that creating the right culture may be the most difficult thing a leader can do. But as many organizations have shown, it is possible, and the rewards are great. Talk to us about the symptoms of poor leadership. We tend to make lists of things that need to be done. But you recommend we make a “Stop Doing” list. Can you talk more about that? You often talk about the equation: Skill x Effort = Results. Tell us how we can continue to increase skills after our efforts have been tapped out. You have mentioned that you’ve never seen a business fail from being too focused. Explain. What are the signs that a leader has a Green Thumb for Growing People? Talk about the notion that structure follows strategy. What is the difference between the two? When it comes to organizational performance, you say that management is like parenting. Can you elaborate on that? When it comes to culture, you say there are often two sets of rules, written vs unwritten. Do you find that they contradict each other? Can you recommend an action that someone could take today to get a sense of where they are as a leader and what they need to improve? Can you give us one of your favorites examples of a company that you helped turn around? You have a forthcoming book coming out. Tell me what it’s about.